3RSystem is a large case manufacturer and they have a great line-up of HTPC cases as well as a complete range of ATX enclosures. One of the most interesting cases being shown is the M-Station which includes an LCD inside the all-aluminum case. 3RSystem is showing Final Fantasy running on the monitor and it looks beautiful. There are other cases using Soundgraph VFDs as well. The HT-1100 is such a case. Once again, this one is built completely out of aluminum. 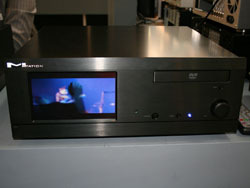 The HT-3000 features a curved front and some mirror finish elements to blend better with A/V equipment under a TV. 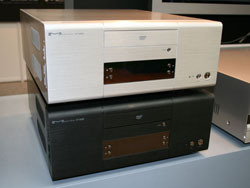 The HT-2000 uses a rounded front instead. 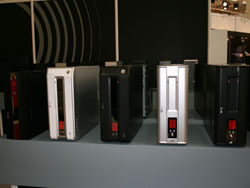 As you can see, all these cases are available in black and silver, use a LCD instead of a VFD and are made from aluminum. 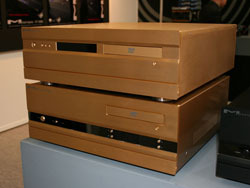 3RSystem is also offering the cases with a golden paint job. This is quite unusual for a case manufacturer, but there are a lot of very high quality home theater systems out there which utilize this color. This is where the golden 3RSystem cases come in handy. 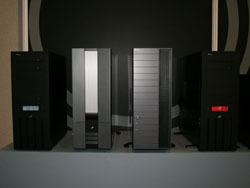 There are several full tower cases on display. There is one with a window, completely black interior and blue LCD, while the others do not have such a window. The material used on these cases is steel with a plastic front. 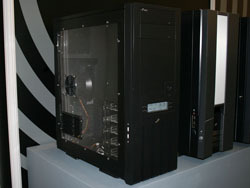 There are quite a few mid tower cases being shown as well. 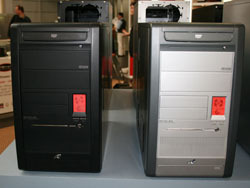 The R600 and R610 have very sleek and simple fronts, while the R410 has a red LCD up front. 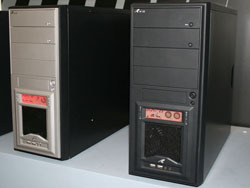 They do not only look much different than normal cases, but are quite cheap. 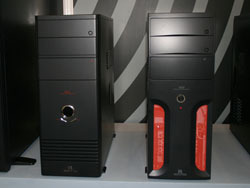 3RSystem has chosen to go with the red & black combination on a lot of their new cases and it does look quite nice. There is a very small enclosure called the R310, which is just as tall as a mini tower, but it can fit a full size ATX mainboard, has a temperature LCD and can take a whooping three 5.25 inch and two 3.5 inch drives. 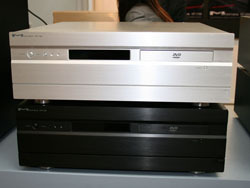 It comes in two color combinations as well and features the usual front connectivity. This is a great case for anyone with very little space and limited budget. The entire line-up of slim cases can also be viewed here. These can fit a mATX and even ATX mainboards and up to two 5.25 drives. 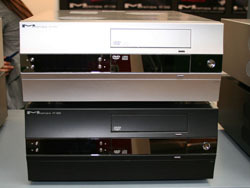 They are - as the name suggests - much slimmer than the usual midi tower case. 3RSystem will be entering the cooler market as well. Their first offering is the iCE AGE which performs better than the Zalman CNPS9700 according to 3RSystem. The interesting aspect of this cooler are the four "direct touch heatpipe" or DTH, as the company calls it. This means that the heat pipes make direct contact with the CPU headspreader, which improves performance. The cooler weighs 590g and the 12 cm fan spins with 1000-2200 RPM and has a rating of 19 - 32 dbA. If that is not enough for a CPU, 3RSystem is letting visitors take a close look at the Poseidon WCL-04 which is a large water cooling setup. 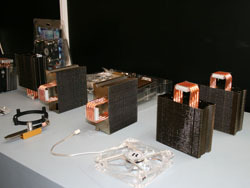 The radiator houses two 12 cm fans and is meant to be placed on top of a case. 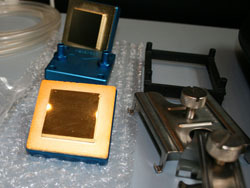 The CPU block consists of gold plated copper and is highly polished. 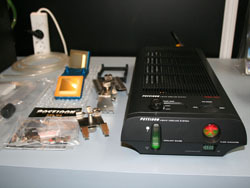 The entire setup can dissipate up to 400W according to the spec sheet. 3RSystem is also working on GPU blocks to complement the system.